Best Western Antlers is located in the heart of historic Glenwood Springs, Colorado. Glenwood Springs, voted “America’s Most Fun Small Town” by Rand McNally in 2011, is perfectly situated in Colorado’s Central Rocky Mountains. At just over 5,500 feet of elevation, this charming western depot is home to geographic and scenic wonders like the Glenwood Canyon, Hanging Lake, Colorado River, Iron Mountain Hot Springs, and Yampah Vapor Caves. 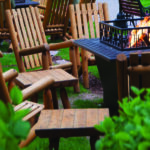 Best Western Antlers is the largest hotel property by land size in the town of Glenwood Springs, CO. Our 5 acres are landscaped beautifully, with a outdoor fire pit, picnic area with volleyball net, and more. You will love our seasonal outdoor pool, as well as our outdoor and indoor hot tub. And of course, you will find the free wi-fi, parking, and breakfast that you expect from Best Western. Take advantage of our web specials, check it out! The 99 guest rooms and suites at our hotel are surrounded by unique Colorado scenery and foliage, not to mention some of the best dining, recreation, and entertainment in Glenwood Springs, CO. This family-owned and operated Colorado Best Western, is a value minded, resort style motor lodge, designed for relaxation and family fun. Traveling to Glenwood Springs with a large family or group? 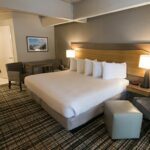 Some of our room configurations can accommodate 6 people to a room! Check our rates and availability at this Glenwood Springs hotel. Arriving in Glenwood on the Amtrak Train’s California Zephyr? We will pick you up at the train station for free. While staying at the BEST WESTERN Antlers, make sure you visit the Glenwood Cavern’s Adventure Park, Iron Mountain Hot Springs, or the Glenwood Springs, Hot Springs Pool — All are only a few blocks away.